For a good portion of the population, remembering both names and faces is a task too astronomical to even conceive of. You meet a fun, new person, and you don't want to be rude — but chances are as soon as they walk away, you've already forgotten what they look like. The problem only exacerbated when you've downed a few drinks to lubricate the mingling process, which is when you meet the most potential new friends and romantic interestes, anyway. NumberSnap is a clever, if not slightly creepy, way to to make sure you never forget a face. Just open up the app when you need to enter a new number, pass it to your new future best friend, and as they enter their contact info, the app will snap a pic with your phone's front-facing camera, putting a name with a face forever. And assuming that you don't want the app alerting your new peer that they're photo is being taken whether they like it or not, you can turn on "stealth mode", which is creepy, yes, but also helps make sure you don't call a relationship before it even starts. Rarely do we take the time to assign photos to new contacts. What's more, it's pretty off-putting for someone you just met to command you to smile as they snap a pic for posterity. This way, you can appear to be a normal human being and still make your name/face flashcards to prepare for the next meeting. Everyone wins. 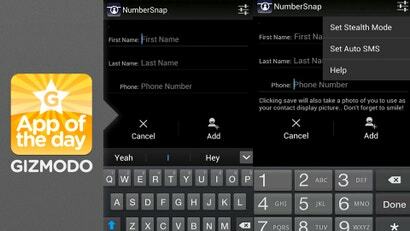 The only downside is that the app doesn't work with the Android contact forms, so when your new friend is entering their number, they'll see the word "NumberSnap" above the entry lines. Chances are, though, that if you're both drunk or overwhelmed with a number exchange, no one will even notice. Hopefully.